A new version of the company's mixed reality headset is now available. Samsung has announced the release of the HMD Odyssey+ Windows Mixed Reality Headset. The device is now available in the US through the Microsoft Store and Samsung.com for an MSRP of $500. "Samsung strives to develop meaningful innovations that deliver unique experiences to all consumers," said YoungGyoo Choi, Senior Vice President of the PC Business Team, Mobile Communications Business at Samsung Electronics. "With industry-leading display technology and an enhanced, premium design, the new Samsung HMD Odyssey+ offers new levels of immersion, improving upon its already brilliant display resolution for a consumer immersive headset." The HMD Odyssey+ Windows Mixed Reality Headset features dual 3.5” AMOLED displays with a combined resolution of 1,440 x 1,600 per eye. In addition, the displays use Samsung's Anti-Screen Door Effect (Anti-SDE) technology to reduce fixed-pattern noise and produce a perceived PPI of 1,233 PPI. Likewise, premium audio tech by AKG is integrated as well, offering built-in 360-degree spatial sound support for simulated 3D audio. Finally, the system also includes built-in Bluetooth, Inside-Out Position tracking with 6 Degrees Of Freedom (DOF), easy-plug-in setup with a compatible PC, and pre-paired controllers for extensive mixed reality and virtual reality support. 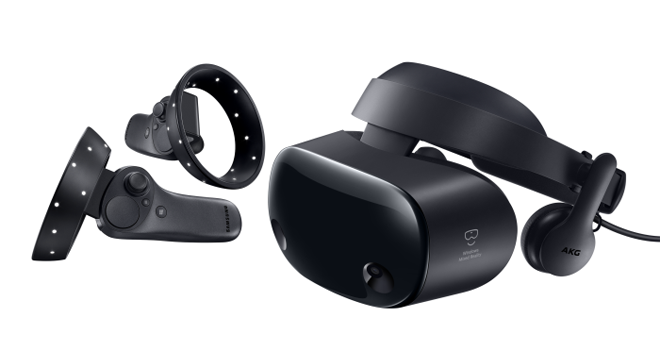 Availability for the Samsung HMD Odyssey+ Windows Mixed Reality Headset is set to expand to Korea, China, Hong Kong, Brazil, and other markets soon. In addition, the device will be on display at the Microsoft Booth at Unite Los Angeles from October 23 – 25.